The precise framework fit is important for the success of implant restorations. 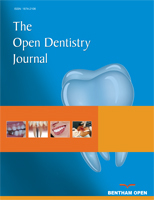 The purpose of the present study was to examine the effect of two different impression materials both of their medium viscosity on the master cast accuracy when parallel and inclined implants were used. An epoxy master cast with three implants was fabricated. The first two implants were parallel to each other and perpendicular to the horizontal plane and the third implant had a 250 inclination in reference to the other two. A passively fitting metal framework that was fabricated over this master cast was used to measure accuracy of fit. Five closed tray impressions for each medium viscosity material (polyether and polyvinyl-siloxane) tested were taken and the respective ten stone casts with three implant analogs were fabricated. The metal framework in the master cast, was fixed in the new specimens and the micro-gap between this prosthesis and the implant analogs was evaluated. The specimens were observed to an optical microscope and digital photography. The data were statistically analysed using a computer software and t-test. Polyether exhibited higher micro-gap mean values (93,4 to 61,8 μm) compared to polyvynil siloxane (30,47 to 14,83μm). The differences were statistically significant only for implant B. The categorical regression analysis (p < 0.01) for all implants showed that the marginal micro-gap was affected by the impression material (94.1%) and significantly by the type of it. The micro-gap values were higher for polyether compared to polyvinyl-siloxane. The torqued implant did not exhibit any statistically significant effect. Keywords: Impression materials, Implants, Addition type silicon, Polyether, Polyvinyl-siloxane impressions, Fixed Partial Denture (FPD). © 2018 Stefos et al.